The c-Jun N-terminal kinases (JNKs) are members of the mitogen-activated protein kinase (MAPK) family and are activated by environmental stress. JNK is also activated by proinflammatory cytokines, such as TNF and IL-1, and Toll-like receptor ligands. This pathway, therefore, can act as a critical convergence point in immune system signaling for both adaptive and innate responses. Like other MAPKs, the JNKs are activated via the sequential activation of protein kinases that includes two dual-specificity MAP kinase kinases (MKK4 and MKK7) and multiple MAP kinase kinase kinases. MAPKs, including JNKs, can be deactivated by a specialized group of phosphatases, called MAP kinase phosphatases. JNK phosphorylates and regulates the activity of transcription factors other than c-Jun, including ATF2, Elk-1, p53 and c-Myc and non-transcription factors, such as members of the Bcl-2 family. The pathway plays a critical role in cell proliferation, apoptosis, angiogenesis and migration. 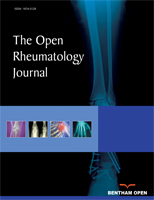 In this review, an overview of the functions that are related to rheumatic diseases is presented. In addition, some diseases in which JNK participates will be highlighted. Keywords: Signal transduction, inflammation, autoimmunity, rheumatoid arthritis..
© Guma and Firestein; Licensee Bentham Open.